Owen spent an entire day at Grandma’s house this week while his brother went to daycare. It was the first time they had been so far apart. As far as I could tell, Owen didn’t seem to notice that he was in a new place or that his brother had mysteriously disappeared. With his dark hair and round head, Owen really took me back to his mother’s infancy. I wallowed in the feeling that I was holding my own baby girl again until the moment I held him up like the baby Lion King – and he objected with an enormous pout that looked just like his sister’s. We got in plenty of cuddling, 4 bottles, 5 diaper changes and a few songs between naps. Owen was completely disinterested in playing on the floor on his tummy. To be honest, he started to wail the minute he felt the ground under his belly. Our dog, Marcy was excited to see him there, however. She’s smelled these babies on me for months without having the opportunity to see them and her excitement wiggled her entire body. Marcy’s seen lots of babies in her 11 years, and to her credit she’s been gentle and interested in all of them. The minute Owen began to cry she nosed him and then she nosed me to do something about it. Of course, I picked him up. It was nice to be able to respond immediately without worrying about the needs of a second baby crying in the background! Taking care of twins isn’t easy but once you’ve become accustomed to it, taking care of one baby is almost too easy! 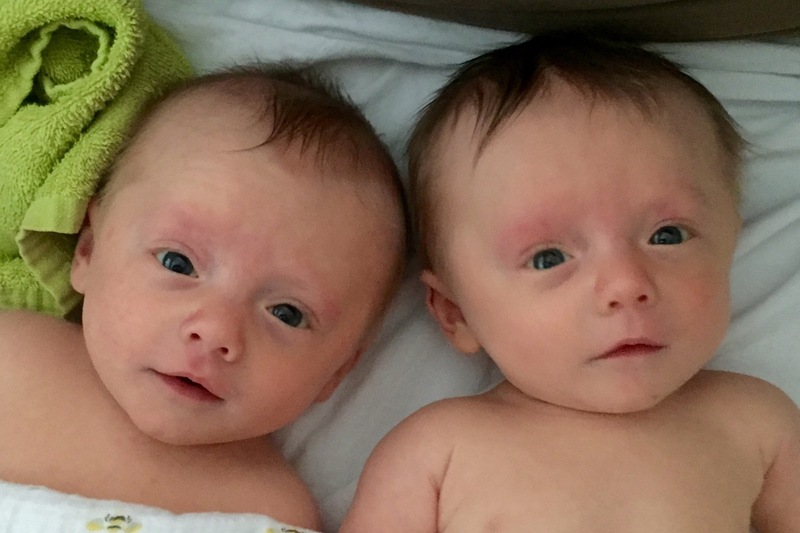 I can’t believe my grandsons have reached the advanced age of 3 ½ months! These babies aren’t the scrawny little mites that came home from the hospital any more. They’ve grown out of their newborn and size zero outfits and plumped up to the point that I’m no longer afraid that I might break a teeny tiny leg as I try to maneuver it into a teeny tiny sleeper. 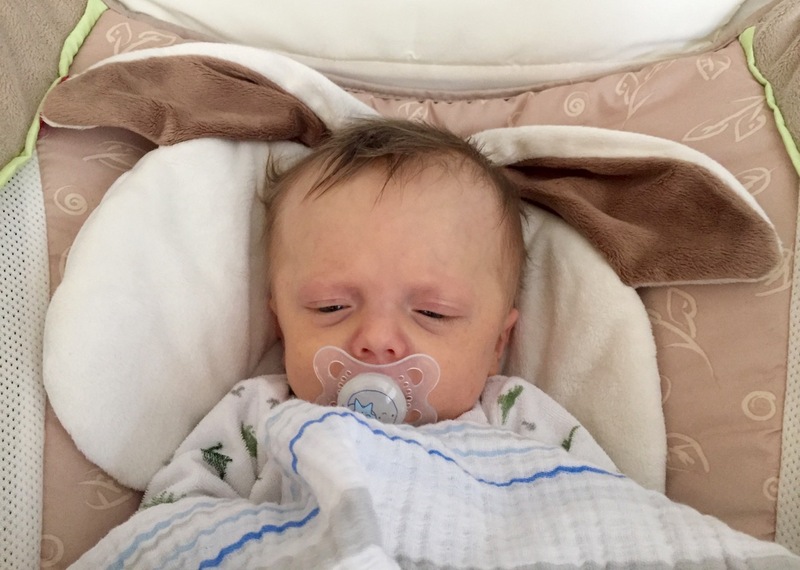 As preemies, they should be lagging about a month behind on their developmental milestones, but as far as I can tell they seem pretty much on par with their peers. Of course, I must remember that I am their Grandma and I’ve thought that they seemed exceptionally intelligent since the first moment I met them in the NICU! I’m pretty sure that they both recognize me. At least I think they do. Maybe they are too young for this sort of behavior, but if so, don’t tell me — I’m really enjoying the feeling that they know I belong to them. When they bestow those lovely smiles that light up the room I feel like it’s meant just for me, and my heart melts. I was worried that I wouldn’t be able to tell them apart, but so far, that hasn’t been much of a problem. Jack’s head is more oval than round and he’s lost much of his newborn hair. This difference in shape is apparently very common in identical twins. Environmental factors and position in the womb can give even identical twins their own unique appearance. ( See http://www.facecomparisons.com/article-321.html ) I am always surprised when visitors ask if we have trouble telling them apart; their differences seem so obvious to me! To test this presumption, their mother cropped photos of them to include only their eyes, nose and mouth. Without the head shape and hair, they are more alike that I realized — I could only guess at their identities!